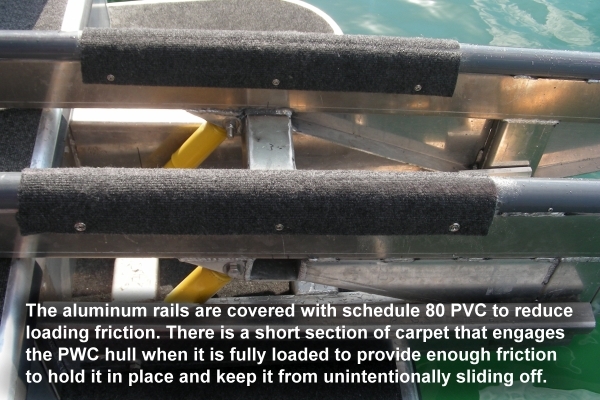 Although no longer available for cost and liability reasons, we wanted to describe some unique Rails we have built for some customers in the past. 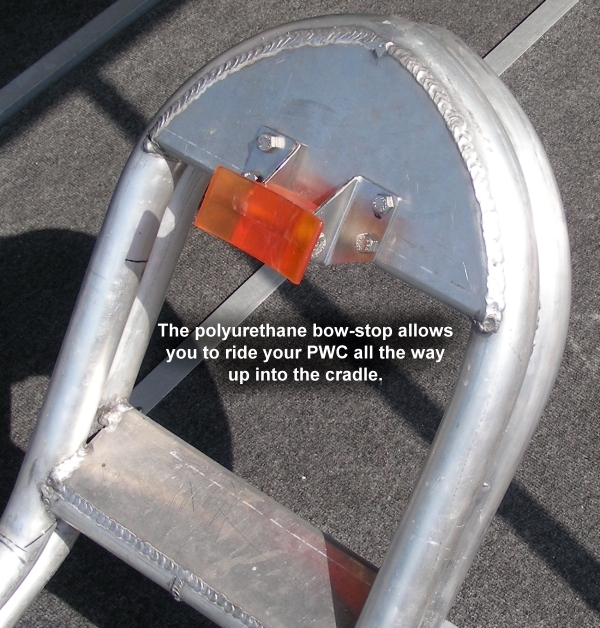 This system allows you to ride the PWC right up the rails into a cradle. 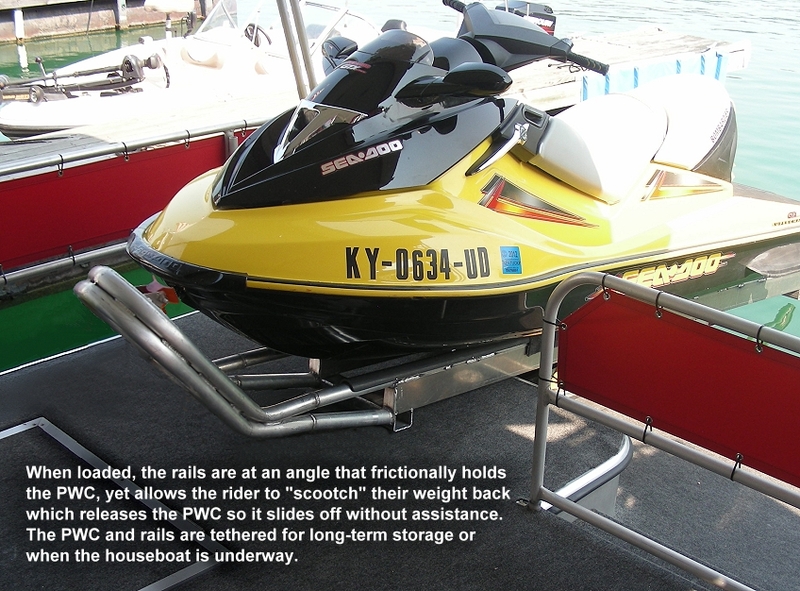 As it passes the center-of-gravity, the rails automatically level for secure storage completely out of the water, whether the houseboat is in the slip, or out cruising. 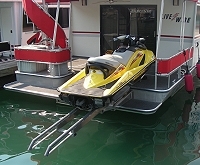 When it is time to play again, the rider just climbs on, "scooches" his or her weight back a little, the rails automatically tilt, and you slide off into the water like in a James Bond movie! 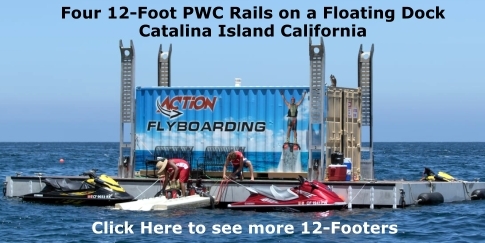 In fact, some people can even do it while the houseboat is underway! 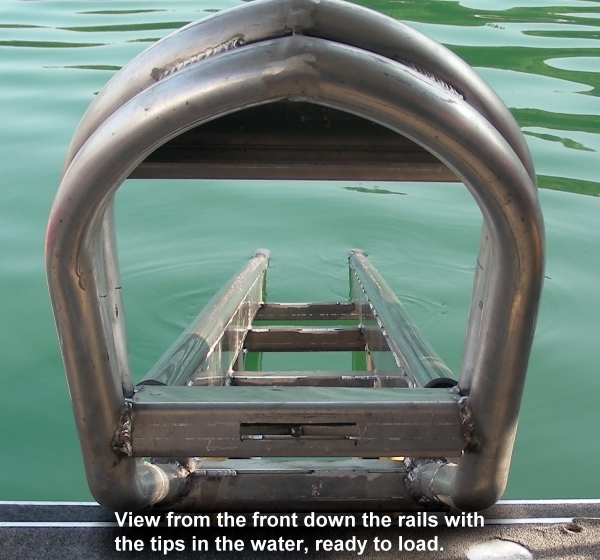 Loading and Unloading is a one-person process that takes 2 seconds...literally. 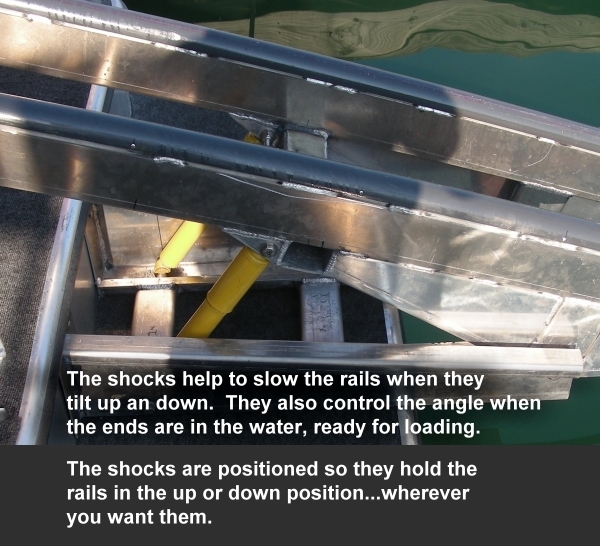 Cost: They are MUCH more expensive than the Winch-Up-Tilt-Up Rails. 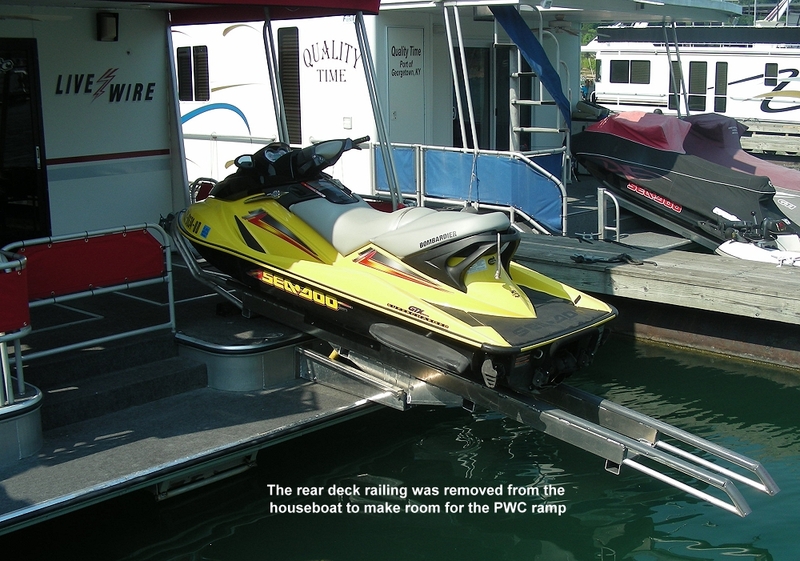 They require on-site measurements and engineering, probable removal of deck railing or other structures, and every element is custom built so there are no templates or volume production savings. While the Winch-Up Rails are pre-made and in inventory ready to ship for between $2,000 and $2500, Custom Ride-On Rails were at least double that cost, depending on variables. 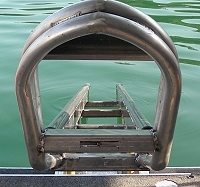 Space: They cannot be tilted up out of the way, so they occupy your swim platform, and some of your rear deck making it very difficult to maneuver safely in coves and around fuel docks. 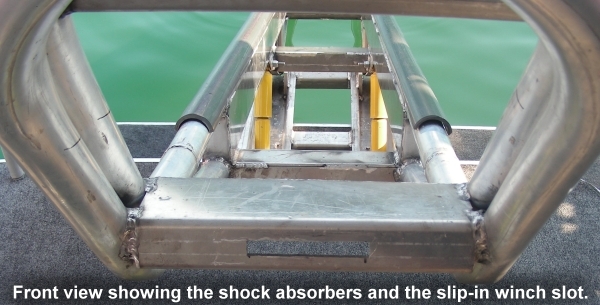 Safety: Without question, accidents can happen if you load too fast and "over-shoot the landing". 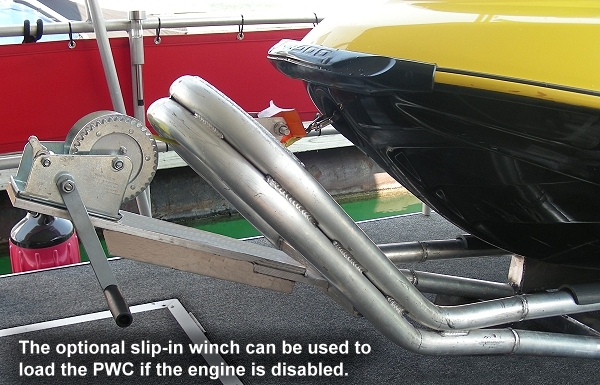 This is fairly easy to learn, but not always easy to execute because of the variables of wind, currents, wet or dry rails, and throttle lag. And by all means, you would never want to attempt loading if you were a little bit, shall we say, inebriated! For these reasons, we no longer offer the Ride-On-Self-Leveling Rail option. We show them here for interest and background. 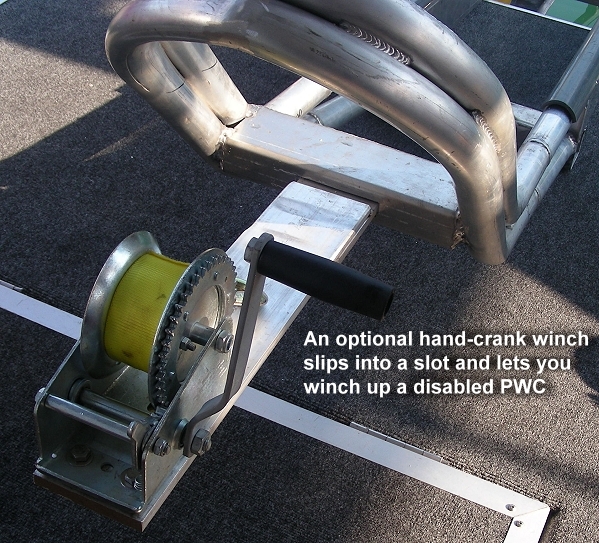 Rather, we offer the proven Winch-Up-Tilt-Up system which has become the standard for storing PWC's on houseboats, yachts, docks, and piers around the world. This YouTube movie clip shows how quick and easy it is to load and unload. 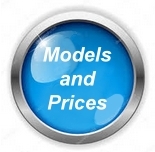 When you click on the following thumbnail pictures of one of our installations, you will see additional caption explanations that should answer most of your questions. Then click your BACK button to continue through the thumbnails.